Each Exchange 2013 SureMail™ account has access to the SureMail™ Control Panel where users can view information about their accounts and view and edit spam settings. To access your SureMail™ Control Panel go to https://admin05.mycloudmailbox.com/. The SureMail™ Control Panel lists information about your SureMail™ account such as how much space you are using in your mailbox or how many devices your SureMail™ is setup on. You can edit your anti-spam options by clicking on Edit anti-spam options under Tasks on the right hand side of the screen. Every incoming email is filtered and given a score. The higher the score the more likely is may be spam. The settings determine which score level is sent to your inbox, junk folder or is blocked completely. Whitelisting an email account will always allow the address to get through the spam filter. Blacklisting an email account will always prevent the address from getting through the spam filter. After listing the email accounts you want to allow or block click Save. 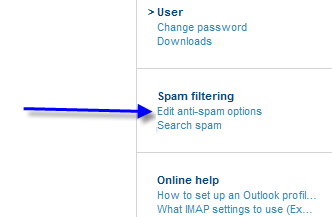 You can search blocked spam by clicking on Search spam on the right hand side of the screen. Please note that spam is only kept for a limited time and you are unable to view emails older than 31 days. 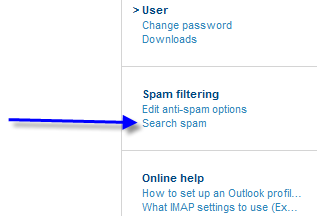 You can search through the spam mail by sender or subject or you can view a list of all mail by clicking on Search. You can view any blocked email by selecting the email using the checkbox on the right and click on Resend selected messages. This will send the email to your inbox. 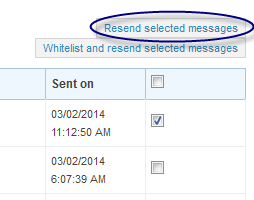 You can whitelist any email by selecting the email using the checkbox on the right and click on Whitelist and resend selected messages. 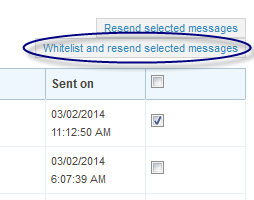 This will automatically whitelist the email address and sends it to your inbox.